Among an expansive brunch menu of clever Southern takes on breakfast classics, none feel quite as quintessential as LouVino’s eggs benedict. Why mess with tradition, you might ask? Probably because the origins of eggs benedict are as murky as a muddy puddle. The inspiration for their variation is pretty darn clear, however, and it’s as Southern as the restaurant’s Louisville roots. Out with the English muffin and in with Kenny’s housemade grit cakes—consider them the cheddar-y pillows your poached eggs never knew they needed. Fried shrimp fills in for ham to remind you that, yes, you should have shrimp and grits for breakfast. 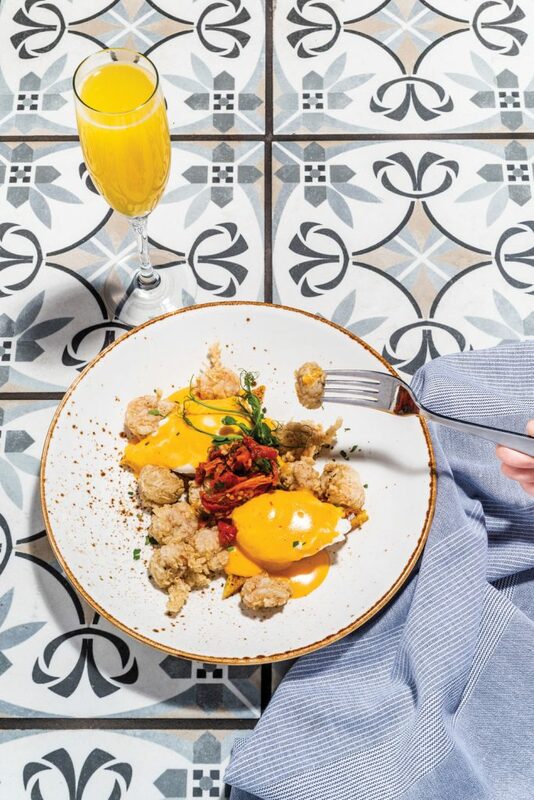 Red pepper hollandaise is the tangy-creamy blanket on top, and a sprinkle of tomato-jalapeño relish sets each bite ablaze.